The following text was written in the mid-1970s by Joseph Arrighi for a Fairchild Republic presentation on the "Survivability Design Features Incorporated in the A-10A Close Air Support Weapon System." All images displayed were provided by Mr. Arrighi. The A-10A airplane was designed from its inception to a complete set of survivability requirements. As a consequence it incorporates over 100 features which significantly reduce its vulnerability not only to weapons that have been responsible for so many combat losses in past conflicts but also to the more potent weapons expected to be encountered in possible future conflicts. These major reductions in vulnerability have been verified by many ballistic test firings against all critical areas of the airplane. The ballistic tests were conducted both during the competitive prototype phase of the A-X program, in which two prototype aircraft were designed and built, and during the development, test and evaluation of the production program. 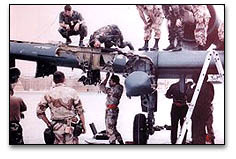 The major reductions in vulnerability of the A-10A airplane provide the required "highly survivable" airplane which will "prevent its loss when operated in the anticipated threat environment". These quotes are from the A-10A system specification. Thus, one of the more essential qualities for providing an effective close air support weapon system is firmly established. Quantitatively, the A-10A airplane is as little as 1/10 as vulnerable as other operationally equivalent airplane types, depending on the threat encountered. Below is a personal account by Col. Efferson of a flight in an A-10 in 1992. I rolled in from 17,000 feet, shallow--30† dive, and bottomed out at about 9,000 feet. I rolled the wing up and looked down to try and pick up any kind of equipment at the intersection, but didnít see anything. I got the wings level, pulled hard in the vertical and then started a left jink. I was about 11,000 feet above the ground when I heard a big thunk and a huge jolt. And just then a missile goes tearing by and that scared the hell out of me. I started kicking out flares thinking I had been hit by a heat-seeking missile and that there were others coming at me. Later I realized that fragments from the hit I took caused one of my AIM-9s to cook off and when it fired, I thought it was a missile that had just missed me. I then looked out at my right wing and it was just full of holes, with fluid oozing everywhere, and then a lot of master caution lights came on in the cockpit. I came into the cockpit and saw that the right hydraulic reservoir warning light and the right hydraulic pressure light were on. Also the pitch SAS and yaw SAS lights were on and some of the windscreen looked like a car windshield looks after it gets hit by a big rock. I looked back out at the right wing again, saw that I had wings level and was climbing, then came in and yelled Mayday over the radio. I kept the airplane climbing and headed South, but I must have made those guys down there real mad at me because they must have seen the hit and here I was still flying. I got lots of RWR indications, like they knew they had a cripple and everybody in the world was locking onto me. I thought about trying to jettison the hung bombs and Mavericks but with all the fuel and stuff oozing out of the wing I didn't want to take the chance of them causing an explosion. Soon we contacted AWACS and they scrambled a tanker so they could support a SAR if I had to jump. But the old airplane just kept right on cooking, and even though I lost the fuel in the right wing tank, I had enough left in the fuselage tank to make it back without tankering. I didn't move it any more than I had tooI did a lot of straight and level flying. As I got close in, I did a controllability check, isolated some systems and was able to get the gear down with the emergency system. I had no flaps or speed brakes but I came in, touched down nicely, but the left tire blew because it had been damaged. I used my emergency brakes but at about 150 knots I couldn't keep it on the runway. Fortunately, it was good, hard ground and the gear help while it skidded to a stop. I turned off the inverter and the battery, unstrapped, raised the canopy, jumped over the side and ran like hell. The blown tire was smoking but the fire crews put that out. Then we started inspecting the airplane. Later, they counted 378 holes in it. According to the frag lodged in the plane, we deduced that all four shells from a four-round clip of 57mm hit me. Two exploded and hit just behind the plane that got the tail feathers and the right engine, which had forty-five holes in it, it wasn't developing full power but was still running when I landed. 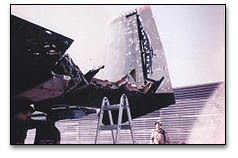 The third round exploded underneath the right wing, which sustained the major part of the damage and cooked off the AIM-9. The fourth round probably exploded right in front up by the nose. If it hadn't been for the titanium bathtub, I probably wouldn't be here. 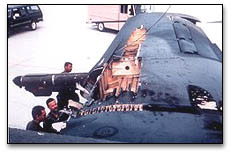 The right side below the cockpit had seventeen major holes in it and the bathtub had a lot of chinks in it. Think of that; seventeen major holes just below the cockpit and I didn't get a scratch! It has to be a rugged airplane to sustain that kind of damage. And five days later they had patched it with speed tape, changed the right flaps, aileron and speed brakes, and flew it back to Fahd. Then, after some work, they got it in shape and we flew it home.